The Trim Removal System TRS 100 is designed to collect the scrap material (crepe paper clippings and trimmed bag tops) produced by the MUA sewing system (on request for FUA, DRC 300, DFC 360). 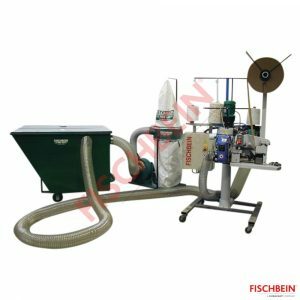 The trim removal system TRS 100 is made up of a metal bin to collect waste of trimmed bags, two air ducts and a vacuum blower unit with dust filter. Capacity: 6000-8000 bag tops depending on size and thickness (current estimate).